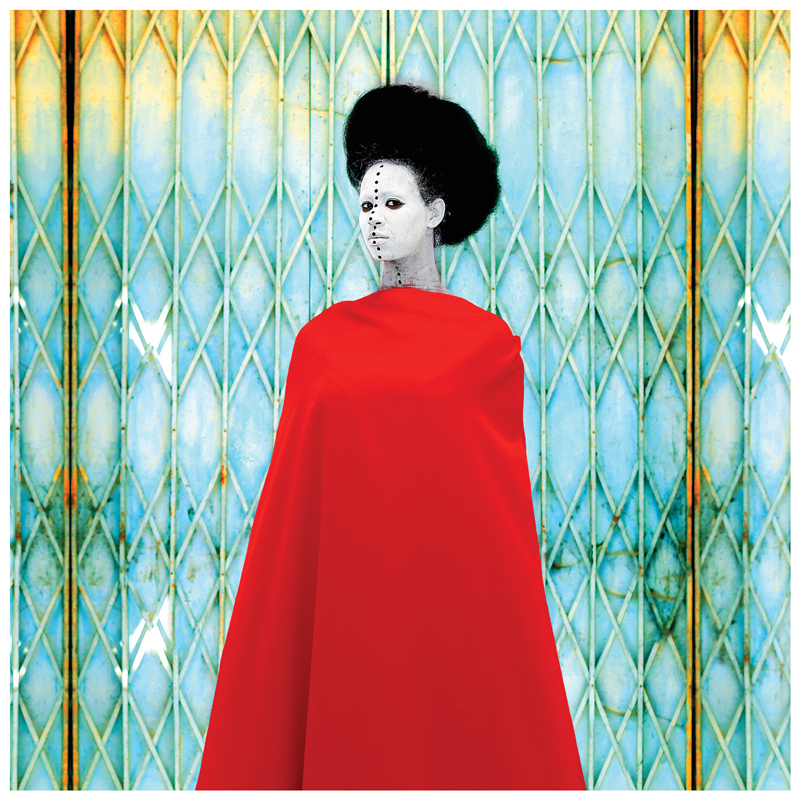 Aida Muluneh, Conversation, 2016, digital photograph, 31½” x 31½”. David Krut Projects. The World is 9, a book accompanying Aida Muluneh’s exhibition of the same name at David Krut Projects, opens with a 2016 photograph of a woman covered from her neck down in a length of brilliant red cloth. The color is a startling contrast to her face, ears, and throat, which are all painted chalky white. A line of black dots bisects her face, as though marking some basic division of being. She wears her hair in a halo-like pouf. Her gaze is stern but tender. Whoever she is, whatever she represents, her presence demands attention. A series of photographs unfurls from this first image. Whether the woman is curled on the ground, standing gallant on a rise, or balanced on a ladder, hers is a painted face, a steadied body, an orchestrated presence. Muluneh, an Ethiopian-born photographer who returned to Addis Ababa in 2007 after years of schooling and working abroad, considers “The World is 9” a response to her grandmother’s expression: “The world is nine—it is never complete and it’s never perfect.” “Each image,” Muluneh writes in an introductory note to her book, “is an exploration of questions about life, love, and history.” These explorations take the form of pictures of bodies, but they are bodies reimagined. “Each work is a reflection of conscious and subconscious manifestations of time and space,” Muluneh concludes. A body may belong to two worlds. I’m reminded of a photograph captioned “Body and Spirit.” It’s reproduced in G. T. Basden’s 1966 Niger Ibos, a book whose unforgivable subtitle reads, “A Description of the Primitive Life, Customs and Animistic Beliefs, Etc., of the Ibo People of Nigeria by One Who, for Thirty-five Years, Enjoyed the Privilege of Their Intimate Confidence and Friendship.” The image interests me for its depiction of an almost-naked man painted white from head to toe on the left side of his body. It was said—according to Basden’s caption—that after certain ceremonies the Igbo (as the ethnic group is properly known) man believed himself to be half spirit and half man. Fellow villagers also believed this to be true. Basden’s photograph is one stopping point in my consideration of Muluneh’s work: I want to understand how a photograph can depict a body existing in multiple dimensions. 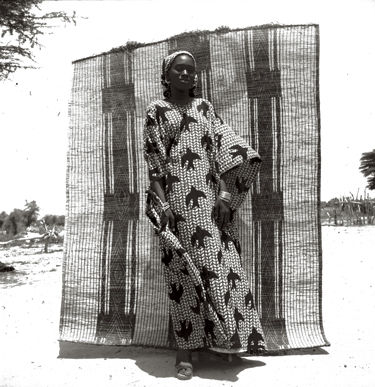 Oumar Ly, Untitled, Podor (Senegal), 1963–78 (printed 2016), C-print mounted on acrylic and aluminum, 19¾” x 19¾” x 2¼”. Sitor Senghor. Muluneh’s protagonist in The World is 9 manifests against a range of backdrops—a rusted metal gate, a railway station, a room with a painted checkerboard floor just like the floors in the stagings of the great Bamako studio photographer Malick Sidibé. Sidibé’s images of young Malians, which were shown at Jack Shainman Gallery, are another reference point, depicting bodies in between colonial rule and independence. However, in her use of backdrops, Muluneh is perhaps closer in sensibility to the late Senegalese photographer Oumar Ly, two of whose photographs were on view at Sitor Senghor’s booth at this year’s 1:54 Contemporary African Art Fair in New York. 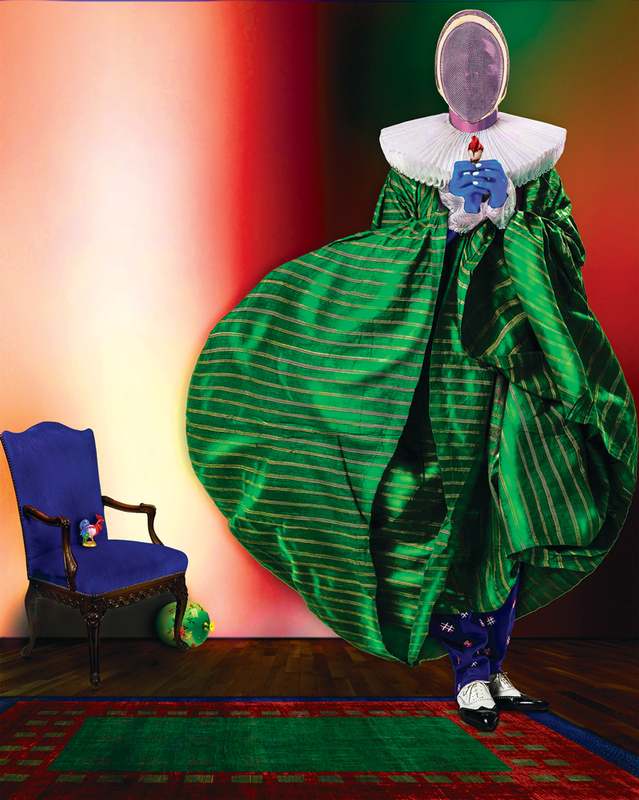 Iké Udé, Sartorial Anarchy #23, 2013, pigmented ink-jet print, 46″ x 37″, in “Disguise.” Brooklyn Museum. There is a tenuous relationship between imagined home and imperfect reality. In Muluneh’s photograph The More Loving One Part One (2016), a woman stands on the topmost rung of a ladder, her right foot inclining downward. It is a balancing act. She faces another ladder—propped, like the first, against a painted sky—as if about to step on it. The expanse of sky surrounding her provides a sense of limitless vantage points and, at the same time, of unpredictable outcomes. Anyone living in a diaspora, who thinks frequently of home, will find the photograph symbolic. There are kinds of beauty that are easily resolved. Almost always this beauty is presented as a commodity or ideal, to be coveted or consumed. But Muluneh’s women, although glamorous, are not so elementary in their appeal. They are made to look like questions. I must not forget that these photographs depict the painted bodies of Ethiopian women. In many African cultures, whether Nubian or Igbo, a woman’s painted body is understood to be both charming and symbolic. There is beauty, and in addition, propositions about life, its meanings and mysteries. I bring into this consideration other photographs of Ethiopian women. Say, for instance, the covers of the December 21, 1987, and August 18, 2008, issues of the European edition of Time magazine, which include stories on famines in Ethiopia. The two covers, appearing 20 years apart, are alarmingly similar. Each woman’s right breast is bared. Each woman carries a starving toddler. Each woman is made to personify despair and elicit pity. The painted bodies of Muluneh’s protagonists are not merely abstract, staged images. Their reimagined bodies—blue, red, yellow, or white—are in conversation with earlier, more reductive representations of Ethiopian black skin. Zina Saro-Wiwa, The Invisible Man, 2015, pigmented ink-jet print 28¾” x 44″, in “Disguise.” Brooklyn Museum. In “Disguise: Masks and Global African Art” at the Brooklyn Museum, through September 18, one of the first works encountered is a striking photograph by Nigerian-born, New York–based artist Iké Udé. Sartorial Anarchy #23 (2013) shows a dandyish figure, likely the artist himself, wearing a 20th-century French fencing mask, a 16th-century Western European ruff collar, a 1940s Nigerian embroidered men’s gown, and 1990s American golf pants. When Udé was a child, he participated in a regular family ritual of being photographed after acquiring new clothes. Just as Muluneh’s The World is 9 addresses the multiple meanings of home, so too does Udé’s photograph. Like Muluneh, Udé makes the pedestrian fantastical. Where older photographers like Sidibé worked with clients who posed with new purses and shiny motorcycles, Udé presents new clothes on a reconceived, outlandish body. Included in the same show are British/Nigerian artist and filmmaker Zina Saro-Wiwa’s photographs of masquerades in Nigeria’s Ogoniland region. Participants in these performances, called Ogele, wear large, ornate masks that reflect recent political history. The Ogele is “a masquerade full of wit, personality, and swagger, performed exclusively by men, that began in the late 1980s,” Saro-Wiwa explains in a statement published in the exhibition catalogue. One photograph is of a half-naked, blindfolded man, wearing white sneakers, pants made from plastic spoons, and an oversize raffia skirt. Another is a portrait of a mask carver. Glancing away from the camera, he holds a mask out to face it. The photograph is a portrait not of the man, but of the mask. 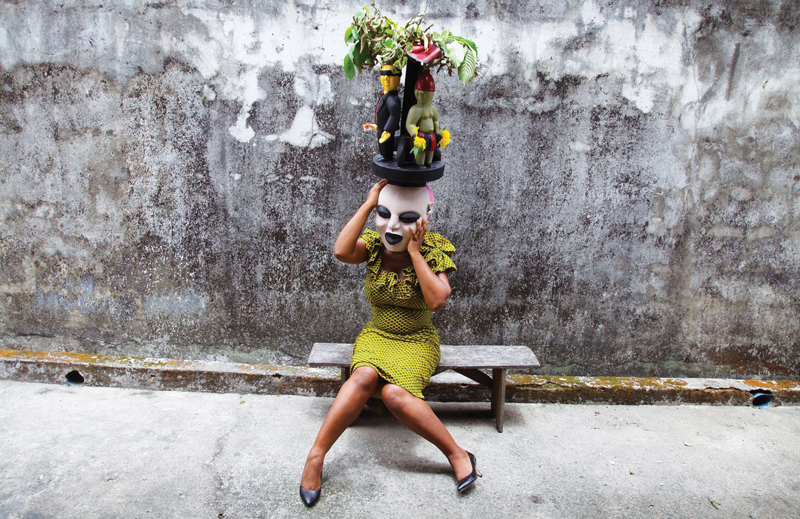 Saro-Wiwa’s interest in masks helps me better understand Muluneh’s interest in traditional African body art. Like painted skin, masquerades emphasize the elaborations human bodies can take on. But most important, they give form to tangled questions of identity, history, and experience. “Back in Nigeria,” Saro-Wiwa notes, “I read an academic text examining how African masks derive their value. A year ago I had read this with interest. But now all I care about is getting inside masquerade, to explore what value it can have for me.” I perceive in Muluneh’s images methodical ways of approaching and expanding on the meaning of configured bodies.